Even though the Lavenders all had a rather long and mediocre Monday (Aaron got so frustrated that he went out and bought 2 Powerball tickets), in our minds we are still basking in the gloriously (and dangerously) sunny weekend. Not that I’m complaining about the amazing sunshine, but we could use a lot of rain. This was the last weekend before our half marathon training begins. Even though I know the first few weeks of training won’t be too much different from the mileage we put in on the weekends now (we did 5. 75 on Saturday and a little over 3 yesterday), knowing that next weekend I will have to start a dedicated regimen of weights, core work, distance running, yoga, and track workouts makes me feel sleepy and sad. Saturday was my mom’s birthday, so it was spent doing mom birthday things like shopping for presents and trying to get the wait staff at Trombinos to do a loud obnoxious birthday song for her (that mission failed miserably). After a rather tasty, rich, creamy Italian feast that won’t as possible starting next Saturday, Aaron and I decided it was time to try out our new Houdini! A couple of weeks ago in a moment of epic Friday night failure, Aaron broke the cork screw. Luckily it was broken in the process of getting the cork out so we were still able to have our wine. The next day we headed over to William Sonoma to pick out our new cork screw only to realize that we are not yet so pretentious that we are willing to spend $95 on (a super fancy amazingly beautiful) cork screw. So, we got the slightly cheaper cousin at Target: The Houdini. 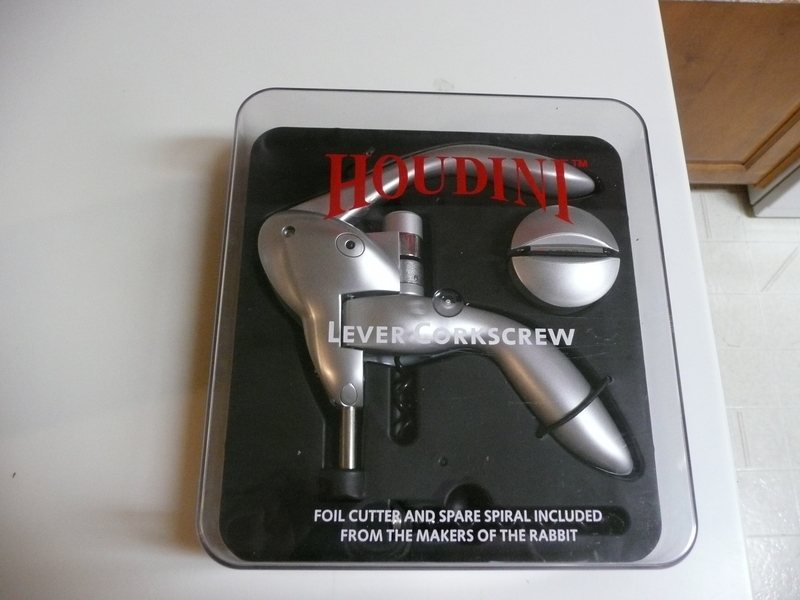 I’ve heard a lot of good about the pricey Rabbit cork screw, but I’m not quite sure what the rabbit does that the Houdini doesn’t. I haven’t been more impressed with a household knickknack… maybe ever. Step 1: cut the foil in one fast, neat swirl. 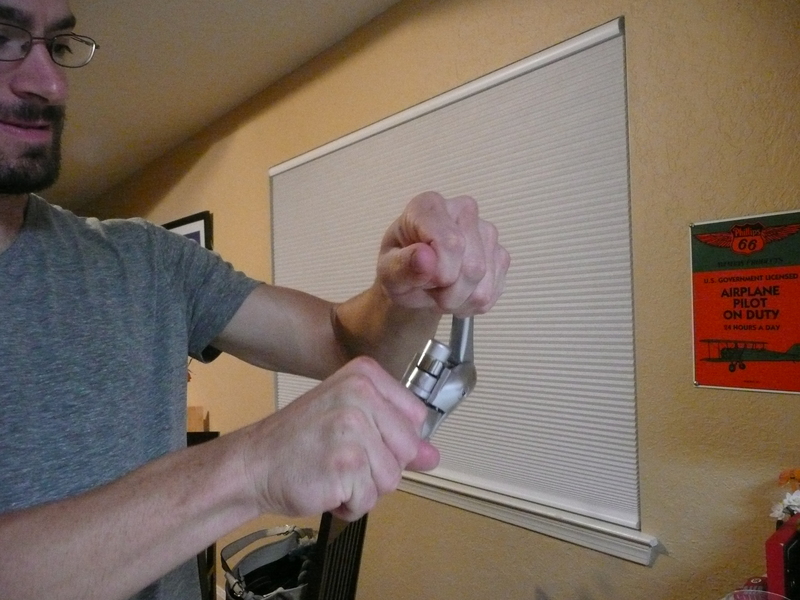 Step 2: Place the Houdini over the cork, and push the lever (which screws into the cork without much effort on your part!). 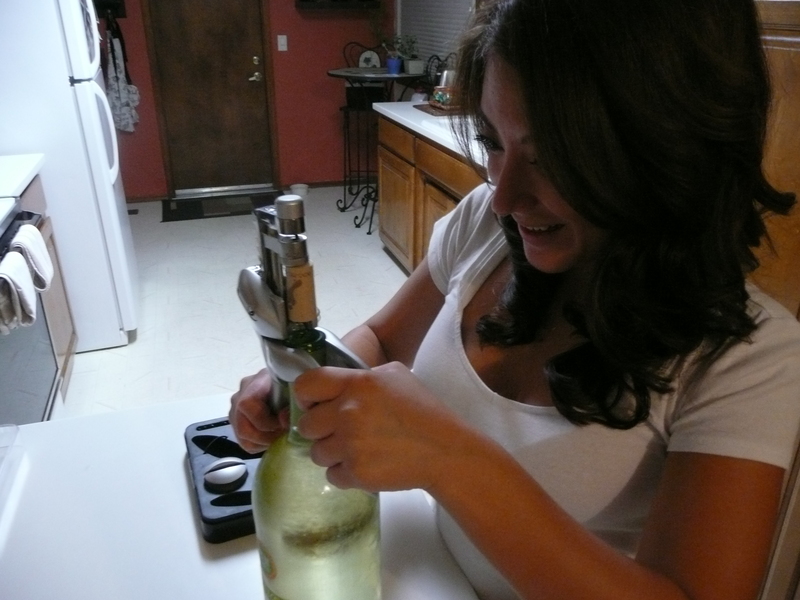 Step 3: Retract the lever to painlessly pull out the cork. 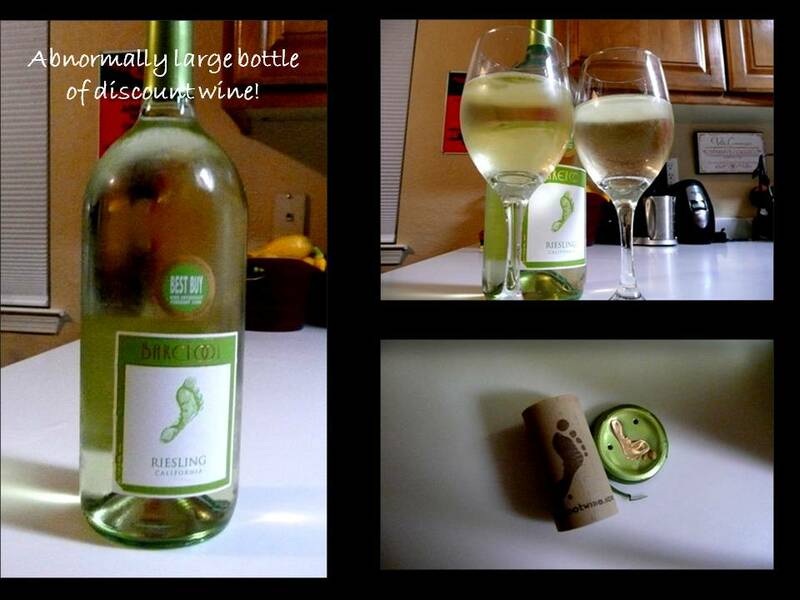 No broken cork parts in your wine, no wasted time trying to get the stupid cork out. Just pure cork extraction perfection. 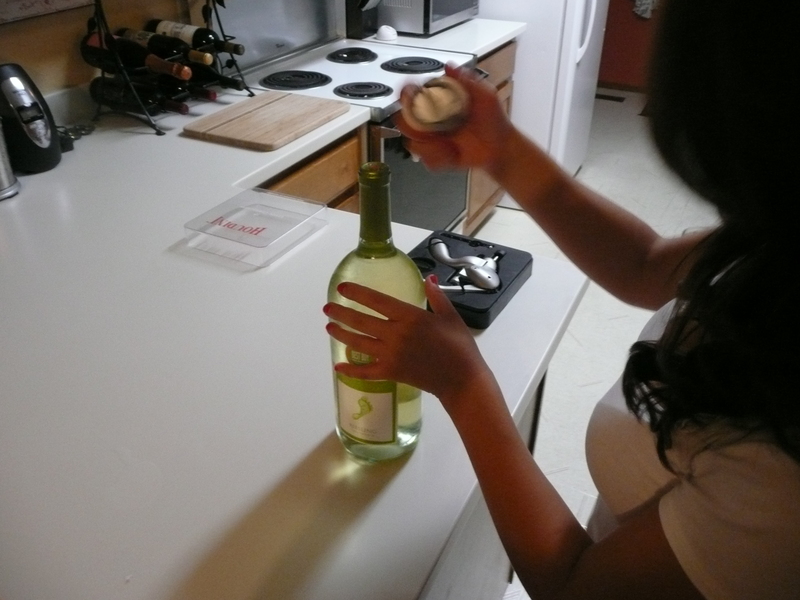 Step 4: Get nice husband to get the cork out of the Houdini while you enjoy the wine. Now, we are Casa Rondena members so we get 2 bottles of good wine a month, not to mention we have a wine rack full of impressive bottles. However, sometimes Saturday nights call for buying a Costco sized bottle of Barefoot. On Sunday morning, after our 3 mile run (and after Crazy Aaron got back from his 26 mile bike ride following our 3 mile run), I figured he deserved some Mimosa, and I thought I would join in because no one should have to drink Mimosa alone. 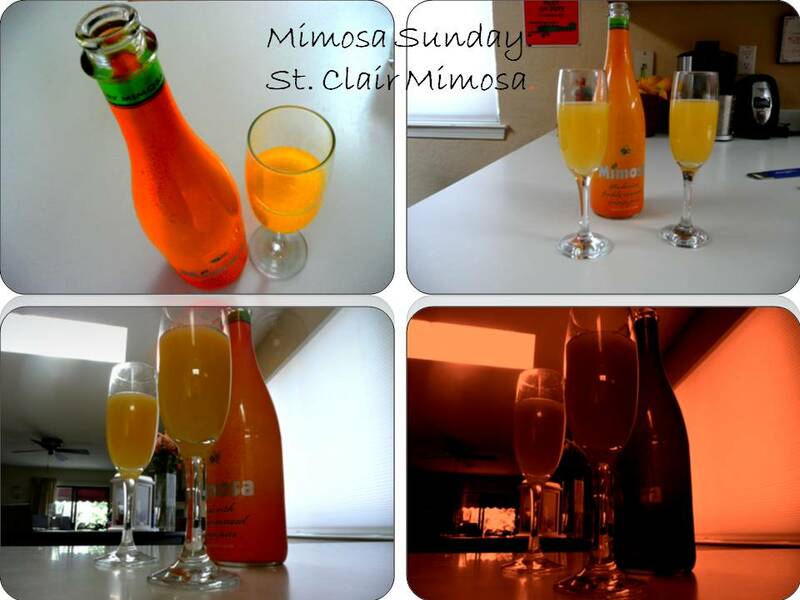 Luckily, we had a bottle of St. Clair mimosa waiting in the refrigerator for the occasion. I figure since we will have to be eating for fitness very soon, a celebratory Mimosa was more than necessary. Sunday afternoon found us at Hallenbrick Brewery, which is one of those little dive pubs in the middle of the Industrial District behind Jefferson. 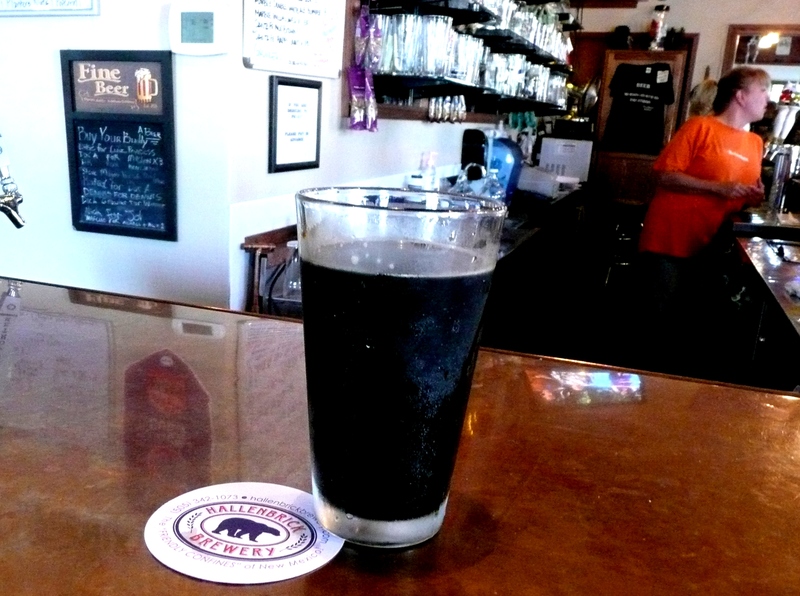 Hallenbrick usually has 2 or 3 of their microbrews (I love the Adobe Stout) and a limited selection of other local favorites. 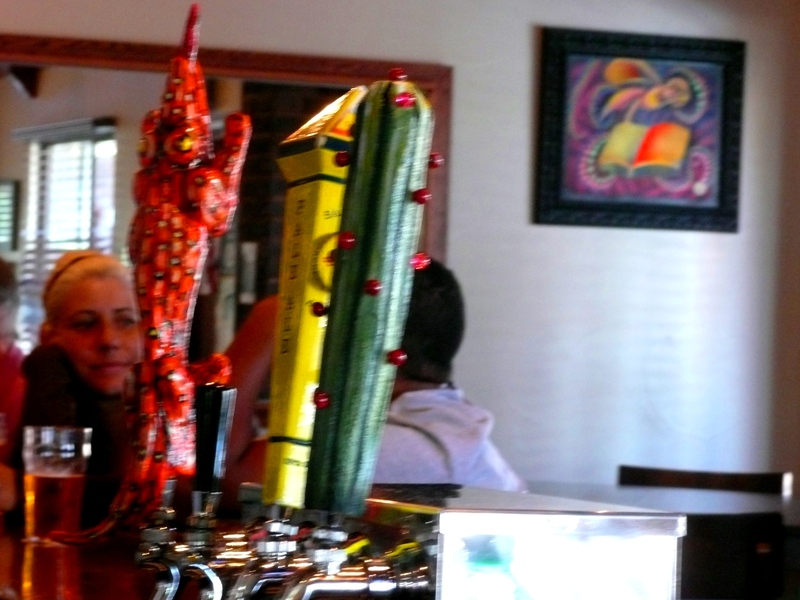 We like going there because it is hardly ever crowded, it is pajamas casual, AND Giuseppe is more than welcome. 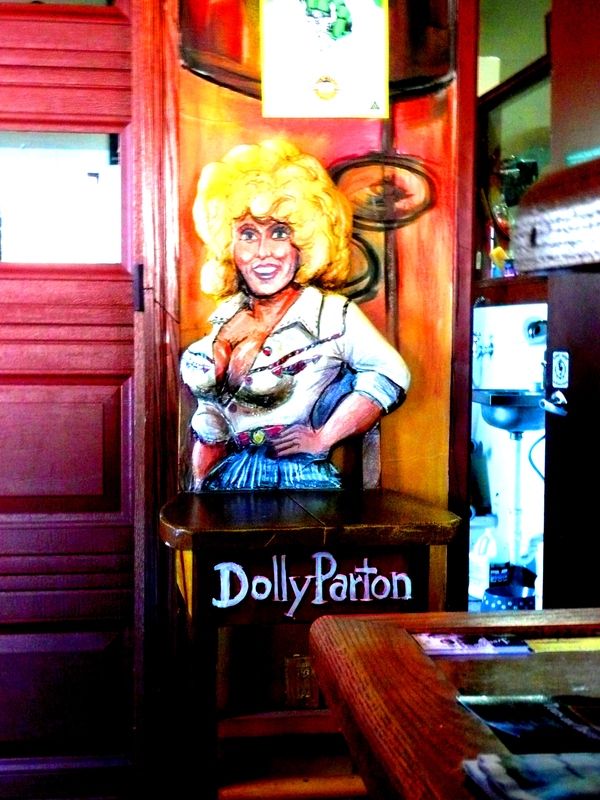 Plus, the bar seems to attract friendly people. Definitely the type of place where you stay longer than you anticipate because you’re having such good conversation with strangers. This was the case yesterday. 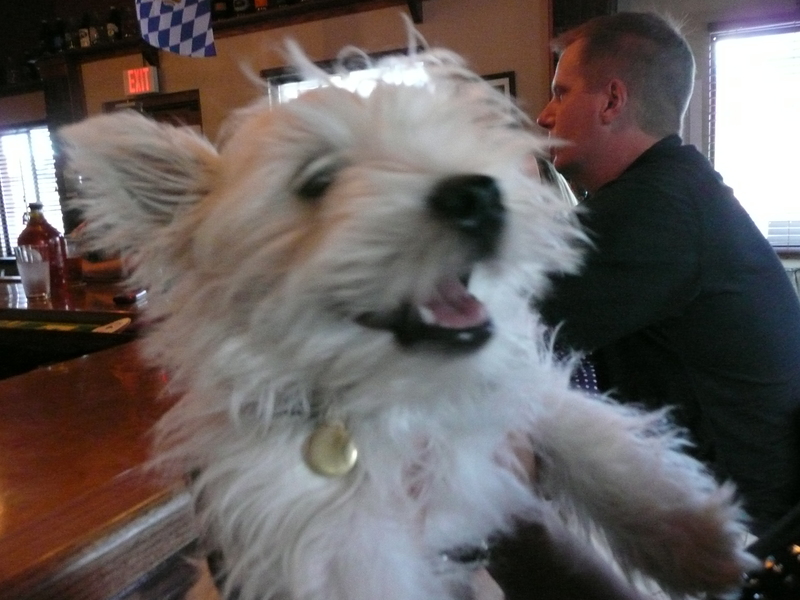 Not only did we chance upon ANOTHER Westie, but we also met a group of people who have a running/socialization group (“a drinking club with a running problem”) and they even talked us into joining their Red Dress Run Fundraiser on August 20th. Basically, I will have an excuse to buy a new red dress (I think Aaron is even planning on squeezing into one! 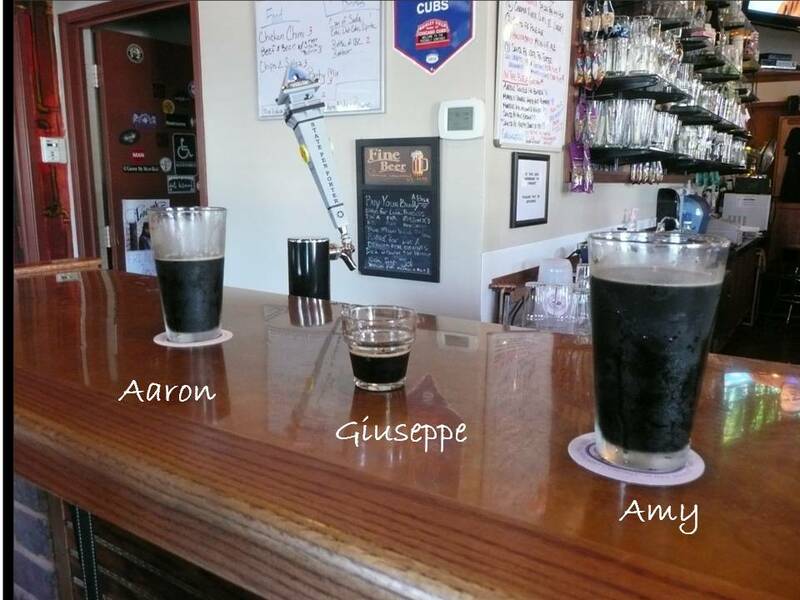 ), and the total run is only 5 miles but you stop at 4 different breweries along the way. Seeing as how 4 of the 5 people who were part of this group were guys, I think this has the potential to be a very interesting event. We were even invited to join one of their runs, though from the sound of it, there is more socializing than actual running so we may have to participate sparingly now that we will be doing our”serious” training. We ended the night and weekend with a viewing of The Goonies, which reinforced my belief that Oregon is cool, and that I have a chance of one day stumbling upon a pirate ship. 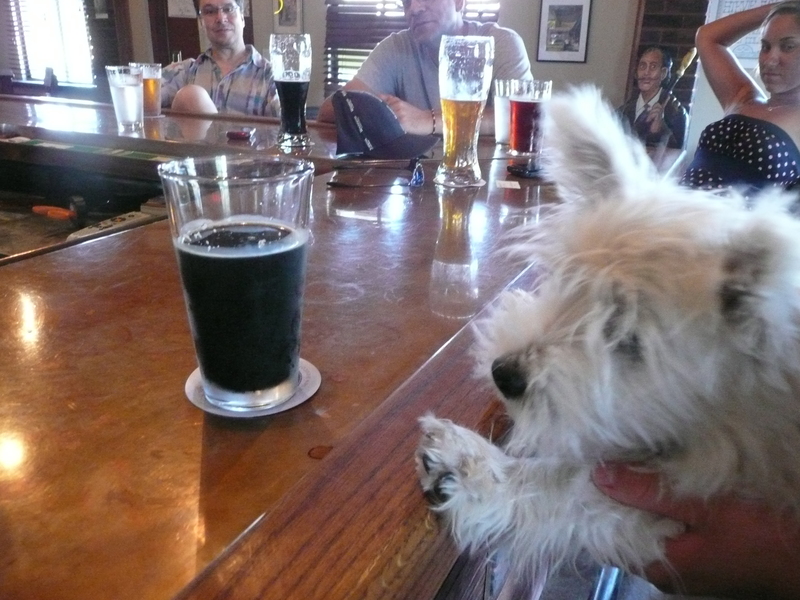 we take our pup to the bar next door sometimes, too. 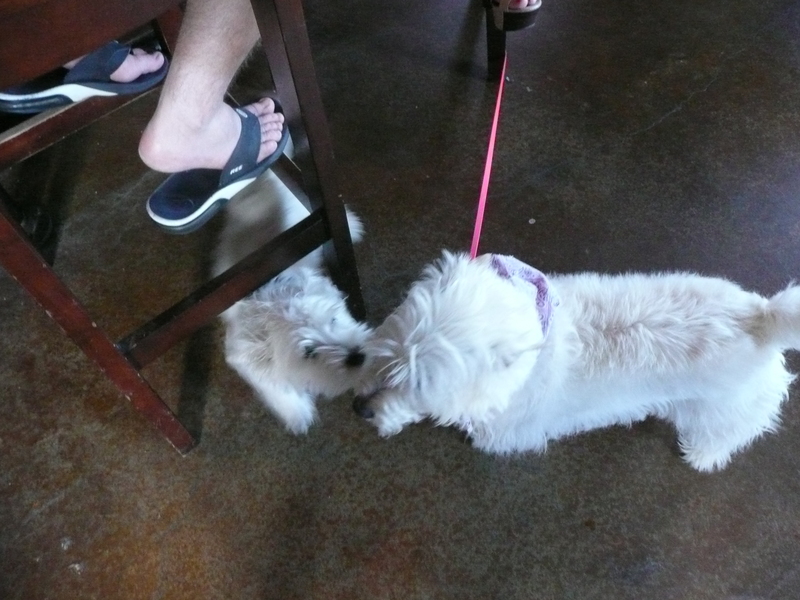 on slow nights, there’s usually a couple dogs hanging out, so it’s like .. a good multitask – dog park + we get to enjoy some brews! now, if only we could do that when we have kids…. haha. I’ve become 10 times more likely to go to a business if they are dog friendly. AND totally agree with you on the kids thing!